3 Carver Court, from the Assessor’s Office (2013). Carver Court, a little midblock passage formerly known as Court Place, is very close to the Gifford House. In fact, the Gifford family was connected with this property until 1913, when it was acquired by Margaret J. Ramos, who owned it until 1929. She and her husband sold the house that year to Betty Lockett Spencer, the wife of the prominent precisionist painter Niles Spencer (1893-1952). To my eyes, anyway, Spencer’s enormously appealing work combines Stuart Davis’s joyful cubism with Charles Sheeler’s sharp focus on industrial landscapes. His rendition of the Unitarian-Universalist Meeting House is an enduringly fresh take on that beautiful — but clichéd — icon. Even more delightful a surprise is Spencer’s take on the scrolled bracket over a doorway. Both Universalist Church, Provincetown and Provincetown Corner are in the collection of the Metropolitan Museum of Art. Spencer had a studio in the former shirt factory at 26 Court Street, but he was using this house in the 1930s and perhaps until the early ’40s, when he and Betty were divorced. His death merited an obituary in The New York Times. By 1946, Betty’s new husband, Ernest L. Perry, a native of São Miguel in the Azores, had set up his public accountancy practice at 3 Carver Court, offering bookkeeping, auditing, and income tax preparation; as well as help with Social Security, withholding and unemployment claims. He died six months after Spencer, in November 1952. His business telephone number, 31, was perpetuated as her home phone number, 487-0031, after Provincetown switched to automated dialing. In 1982, following Betty Perry’s death, the property passed to the couple’s two daughters, Doris and Muriel, and their husbands, Ralph J. Westnedge and Charles Veloza. 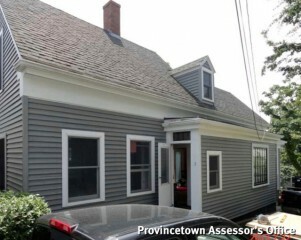 Veloza’s estate sold 3 Carver Street in 2013 to Scott Watters and Richard D. Porreca, a residential and commercial construction project manager and an illustrator whose pen-and-ink line drawings of Provincetown architecture can seen on the Facebook page, Inked Well Illustrations. Porreca told me in 2015 that he and Watters had found pieces of Spencer’s artwork in the attic of the home and, during a renovation, evidence that the house had been constructed on a foundation of ship’s masts.